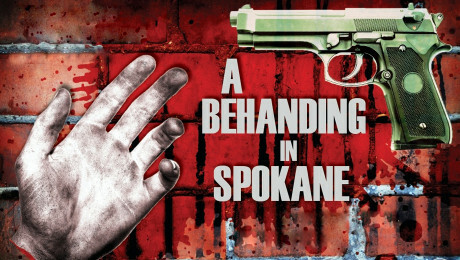 A Behanding in Spokane is a very dark, very funny little play. 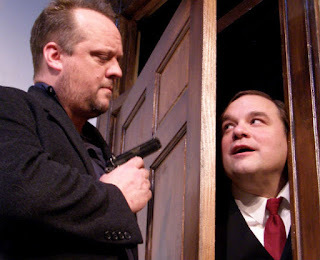 The 2010 Tony nominated play by Irish playwright Martin McDonagh is this year's selection in what has become Gremlin Theatre's tradition of non-holiday fare in this month of Christmas Carols and jingle bells. I saw it on a three-show weekend, sandwiched between Yellow Tree's Miracle on Christmas Lake II and A Don't Hug Me Christmas Carol. It serves as a nice palate cleanser, but more than that, it's a great play with a fabulous cast of actors that's thoroughly entertaining any time of the year. 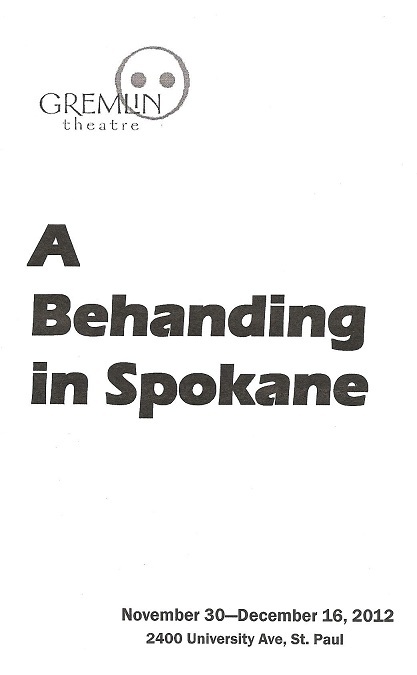 The play takes place in a shabby hotel room somewhere in America (kudos to designer Carl Schoenborn for creating the appropriate level of shabbiness). Mr. Carmichael has been traveling around the country for 27 years, looking for the hand that was taken from him as a teenager in a cruel act of violence. He's full of rage and revenge; you get the feeling that this searching for his hand business has been a hard life, but it's all he's ever known. Portrayer David Tufford embodies the years of frustration, exasperation, and darkness this man has lived through. Even though in some ways he's the villain of the play, threatening violence to every other character, you can't help but sympathize with him when he shares the details of how he came to be a one-handed man. There's a sadness there too; once he accomplishes his goal, he's got nothing else to live for, and the life he's known is over. The event taking place in the hotel room before us is a sort of business transaction. A couple has decided to try to sell him a disembodied hand that they know is not his, but this man is not so easy to fool. He does not enjoy being scammed, and the consequences are dire as the two try to get out of it. Sara Marsh as the slightly dimwitted Marilyn and Brian J. Evans as her somewhat savvier boyfriend Toby are very entertaining as the alternately loving and bickering couple. Last but certainly not least in this talented four-person cast is Luverne Seifert as "the receptionist guy." I adore Luverne; he's a true clown (I mean that as the highest complement). He's extremely expressive in his delivery and physicality, and is an expert at engaging the audience (go see him in a Ten Thousand Things production and beware if you're sitting in the front row). He delivers an insane monologue that's really about nothing, other than establishing what a strange character this Mervyn is. He inserts himself into the situation happening in the hotel room, and is actually quite delighted that something exciting is finally happening in his life. I won't go into details about how this situation is resolved (you'll have to see it yourself to find out), but it's a crazy fun ride to watch them get there. I only discovered the Gremlin a year or so ago, but they've quickly become one of my favorite theaters in town. Everything I've seen there has been interesting, or surprising, or touching, or silly, or all of the above. 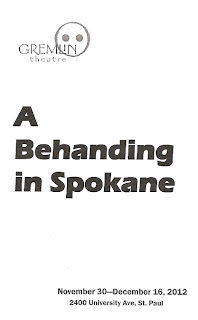 A Behanding in Spokane (with excellent direction by Matt Sciple) is no exception. Gremlin Artistic Director Peter Hansen* called it "an insane play and ton of fun to do." It's a ton of fun to watch, too. Playing now through December 16 at Gremlin Theatre in St. Paul. *Peter was working the will call desk the night I attended, talk about hands on (no pun intended). Peter will soon be reuniting with his After Miss Julie costar Anna Sundberg for the Jungle's production of the recent Tony Award-winning play Venus in Fur.